Travelling is not just about the great stories and amazing experiences. It’s also about the rough patches and not-so-great times. Perhaps other travellers will read this and find comfort in reading about someone else having gone through the same thing. Those two little words immediately conjure up feelings of dread and paranoia. Just reading those two words makes me feel like I need to scratch imaginary bites. Except this time, they were not imaginary. Room with a view. Little did we know what horrors hid under the bedsheets. Don’t get me wrong, not all cheap places have bed bugs. Even luxury hotel chains can have a bed bug problem. However, the risk of bed bugs are perhaps a little greater with cheap places since they attract a certain type of traveller. The type of traveller that covers a lot of ground over a short period of time, which increases the chance of picking up unwelcome hitchhikers along the way. Getting bitten by bed bugs while travelling is different from dealing with a bed bug infestation at home. The former is a little easier to deal with, although the symptoms are pretty much the same. It’s not the first time this has happened to me, so I knew how to deal with them. Nine years ago, my girlfriend and I were backpacking through western Europe and got attacked by bed bugs in Venice. We found that all the hostel options in Venice were too expensive for us and opted for a €12/night stay in a campground just away from the centre. We luckily had sleep sacs. The sleep sacs gave us a thin layer of protection between the old, scratchy blankets and our skin. We ended up with only a few bites on our arms and faces. We initially didn’t know what they were. They were a series of several tiny red spots, all clustered in a small area. We later found out they were bed bites when they turned into angry little red welts that took days to heal. This time around, I wasn’t as lucky. I didn’t have a sleep sac so the whole of my arms and some of my legs got covered in bites. They itch like crazy . It’s taking all my willpower to not scratch like a madwoman. When a person’s home is infested with bed bugs, it’s a nightmare to get rid of. You need to call in expensive, professional exterminators to get rid of them. And even then, there’s a chance that not all bed bugs are caught. To get rid of bed bugs when travelling, you just have to leave the place that has bed bugs. However, to make sure you don’t carry them on with you, you have to isolate all the clothes that you wore by placing them in a plastic bag and sealing it shut. When you get a chance to, wash all those clothes in hot soapy water and then run them through a hot dryer cycle. Basically, keep the clothes at above 45° C for a minimum of 15 minutes. Unfortunately for us, a lot of the laundry services offered in Cartagena don’t use hot water to wash their clothes. So we boiled water and washed them in the sink. One cycle of boiling water to wash it, another cycle of boiling water to rinse it, and then we hang-dryed the clothing. For extra measure, we then sent all our clothes to a laundry service for another round of wash and then the hot dryer. The humidity and heat of Cartagena (which is right on the Caribbean coast of Colombia) actually irritates the bites even more and makes it pretty unbearable. I was pretty miserable and itchy for the first few days after I got bit. Seriously, I was on the verge of crying. 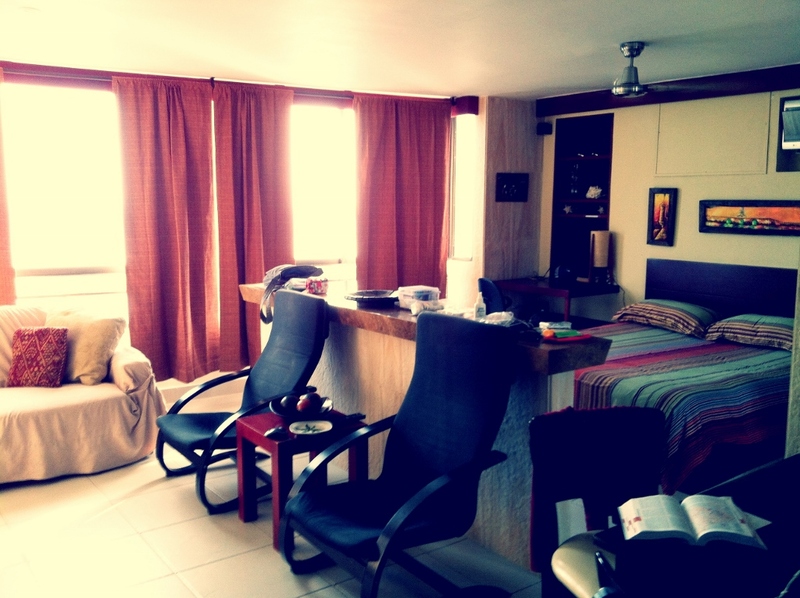 So we’ve rented an air-conditioned apartment for the week so that I can recover in comfort. It’s actually a little bit of paradise after the hot hostel we had to stay in. So we’re laying low for a the next few days so that my skin can heal. Our little slice of air-conditioned paradise. Interestingly enough, Jason didn’t show any signs of a bite until almost a week later. Different people react differently to bites. Some don’t react at all, some show signs within minutes; while for others, it can take as long as weeks for bites to appear. So how about you, any travel horror stories to share? 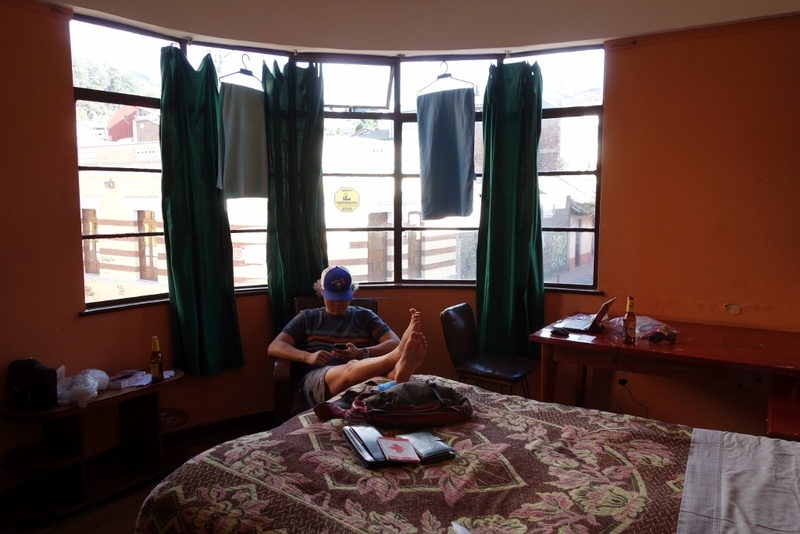 This entry was posted in Colombia, South America, Travel Tips and tagged Bedbug, Bogota, Cartagena, Colombia, Hotel Aragon, La Candelaria by Jenn. Bookmark the permalink. I picked up 11 ticks in Virginia. Found one in my belly button. Hope you’re all better now. Looks like a pretty sweet apartment. Haha thanks Phyllis. I have to admit, it’s taking a long time to fully heal. My arm’s still covered in spots. But at least the itching is pretty much all gone! Yes, bed bugs are annoying!! But you are right, it’s not the basement bargain accommodations that have bed bugs. I have heard of friends getting bitten by bed bugs even in high end, expensive hotels. I’ll share one of my travel horror story with you. I got extremely sea sick on a little boat while going from one island to another island in Ecuador. I didn’t have time to run to a plastic bag and I threw up all over this little boy. I felt nauseous and dizzy for the rest of the day! Gravol is very helpful for boats. Ahhh! That is a pretty horrific experience. :( Poor you…and poor boy! Oh! Weird that it was also in Bogota! Strange coincidence!